Helloooo, Pink Kashmir! This may well be the boldest pink lip color I've ever tried. In my defense, I thought the swatch looked much, much lighter when I clicked "Add to Cart." 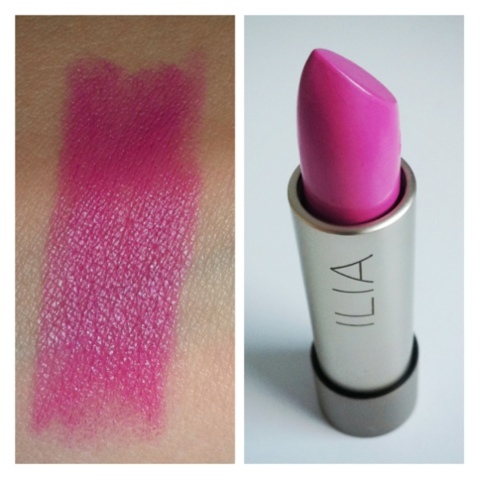 Needless to say I was a little surprised when I slid the cover off the pretty ILIA lipstick tube to find... this MAGENTA! Well, maybe this is a sign that I need to stretch my pink-lipstick-comfort-zone. I do like the color, I really do. And the vanilla scent. And the luxe packaging (ILIA, you are killing it in the design department!). But this makes me think that I need an occasion to wear Pink Kashmir.. Like, maybe I should ditch my studies for the night and let loose a little. Maybe get dressed up and go out dancing and stay up really, really late. Who knew that a lipstick could invoke my inner 21-year-old?